Later topic: Can you name this guillotine? 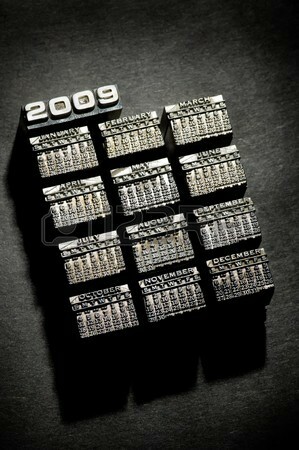 KPetersen posted a classified looking for wood types, cuts, rules, etc to be used in creating calendars. I have been meaning to post some photos of a pretty cool little set of calendar types that I inherited, and this seemed like the perfect opportunity. 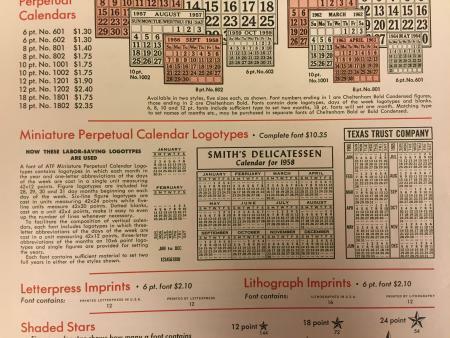 I have what I believe is a complete set of lead foundry types for producing the kind of “calendar within a calendar” that one would find on traditional calendars. These types would have appeared on two unused calendar grid squares, with one showing the previous month and the other the next month. Given their size, I estimate that they would have been used on a calendar with days that are formatted to approximately one inch wide, and about the same in depth. The size of the actual letters and figures is tiny— 4 or points perhaps? Both the month/day types and the numbered date types are cast on 42 point material, making them 3.5 picas wide. The depth of the numbered date types varies a little bit, based on how many dates each one is displaying and the day of the week on which the month begins. These types are in reasonably good condition. In all, there are 73 pieces. There is some mild oxidation, primarily on the sides and the feet. They came with numerous sorts from my dad’s print shop, although I don’t think he ever printed with them. I have not proofed them, but would be willing to if folks have an interest in seeing them. If anyone ca identify these, please reply. I have not seen them as a Handy-Font or otherwise in the catalogs to which I have access, although a Google image search did produce one photo of a set of these with a transposed or flopped technique to make them appear right-reading in the image. I have attached that photo, as well as some low res versions of my types. I have numerous other photos of these at higher resolution, if you anyone is interested in seeing them. It is from ATF, used to see them in almost every shop. There are also smaller month sorts that align to the side of the block for a more compact calendar.